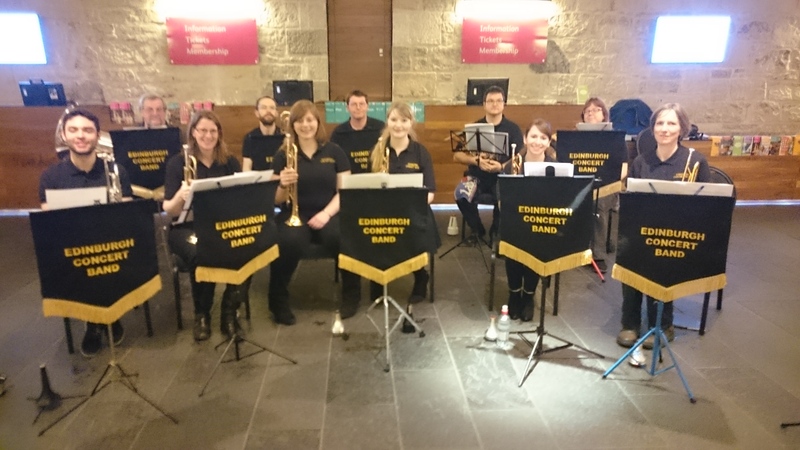 On Wednesday 2nd December, our brass players entertained the clientele at the Brewin Dolphin Christmas Cocktail Party at the National Museum of Scotland. “One of the reasons I started playing the trumpet again after a few years break was because I missed the Christmas concerts. I’m not a very Christmassy person but playing all the old favourites always managed to put me in the mood for some eggnog and a Santa hat! So what better way to start the 2015 Christmas countdown than to play carols for an hour solid?! I’ve been playing at the Brewin Dolphin event for a few years and always really enjoy it. Although we are really the entrance music as people come in we always get a good reception, lots of applause as people go past and kind words about how much they enjoy our playing in the breaks between tunes. A few years ago a waiter appeared with a tray of Champaign flutes (the glass ones not the noisy ones that sit in front of the mighty brass section at rehearsal!) for us and proceeded to drop the whole thing on the stone floor right in front of us, ever the professionals we continued playing despite Alan jumping out his skin! He did come back with some more later! The team at Brewin Dolphin really appreciated the festive welcome for their clients. Thanks again to all the players for an excellent performance! ← Welcome to the new ECB website!